Tin Can Making Machine is very good option to start a small business at home. The demand of can is found all throughout the year. Jam, jelly, meat, fish, sweets etc. things are sold after packing it with various can. With the Can Making Machine you can make small, big, fat, thin-all sizes can. At first you have to buy laminated tin sheet from the market. It is available in cheap price in the market of Barobazar and Maniktaka in Kolkata. You can make cans of different sizes with adjusting dies. At first cut the tin sheet according to the size of can you want to make. Then put the sheet in the indicated place of machine. Start the machine and the sheet will come out in round shape. Now put the round shaped sheet in the other indicated place of the machine and your cans will be made automatically. It needs 2 hp motor and 220 volts to operate the machine. The price of the Can Making Machine including motor is approximately Rs.80, 000. The price of the adjusting dies is approximately Rs.5, 000 to ERs.7, 000. 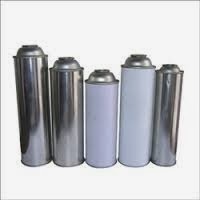 You can find many companies manufacturing a wide range of Can Making Machine. Their machine matches high technology electronic control.